School is in full swing and the kids are adjusting well. We had a few new challenges thrown our way, with Mags now attending middle school and having to be ready for the bus earlier than ever, but that’s going well. I, however, have not fully adjusted to the very strict policy on which foods are allowed in school. It’s not that there weren’t already restrictions on the elementary level. Peanut and tree nut allergies were part of reality, but that was on a classroom by classroom basis. If someone in your class had a food allergy, then you were forbidden from bringing in that item; otherwise, there was an allergy-free table for lunch and we mostly went on our merry way. In fact, I don’t think either of my kids ever were a part of an allergy classroom, so it didn’t hugely affect our lives. At least, not in a mandatory ban kind of way. Despite this unexpected freedom, Mags often sat at the allergy-free lunch table anyway because one of her close friends, who has a peanut allergy, was there. Voluntarily, we had to avoid sending in anything with peanuts and tree nuts, which was fine. Mags wasn’t a big fan of peanut butter anyway. We found ways around it. No big deal. At the middle school, however, there is a school-wide ban on not only peanuts and tree nuts, but fish and shellfish, too. A very strict ban, to the point where they’re asking that we ensure the children have thoroughly washed their hands before they attend school and to be certain that there isn’t the slightest possibility of a fish oil cross-contamination. So there goes tuna off the safe lunch list. 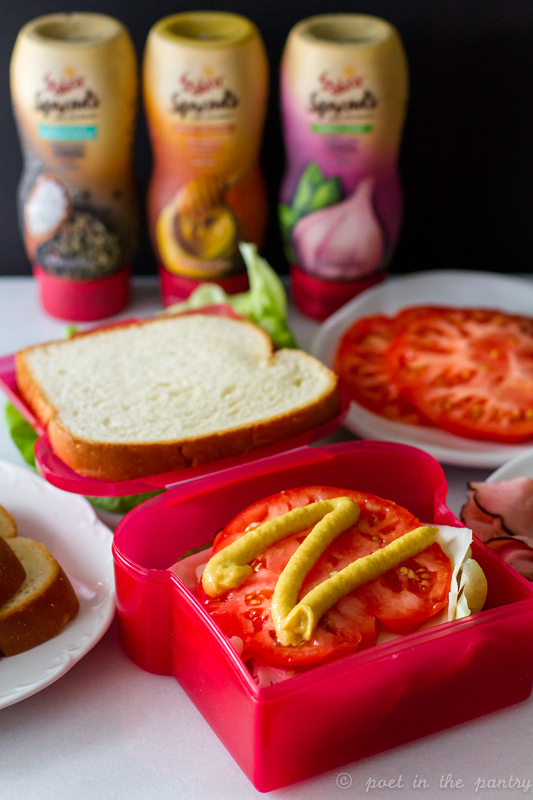 What’s allowed dwindles every year, and the cost of packing lunch grows because of it. When your options become limited, you find comfort in the little things. 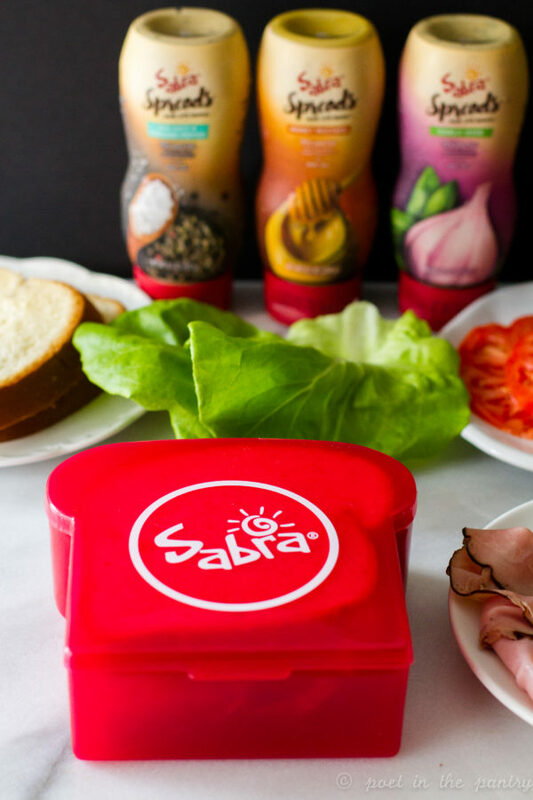 Like the fact that Sabra has just released a line of hummus-based sandwich spreads! This might just be our saving grace this year! 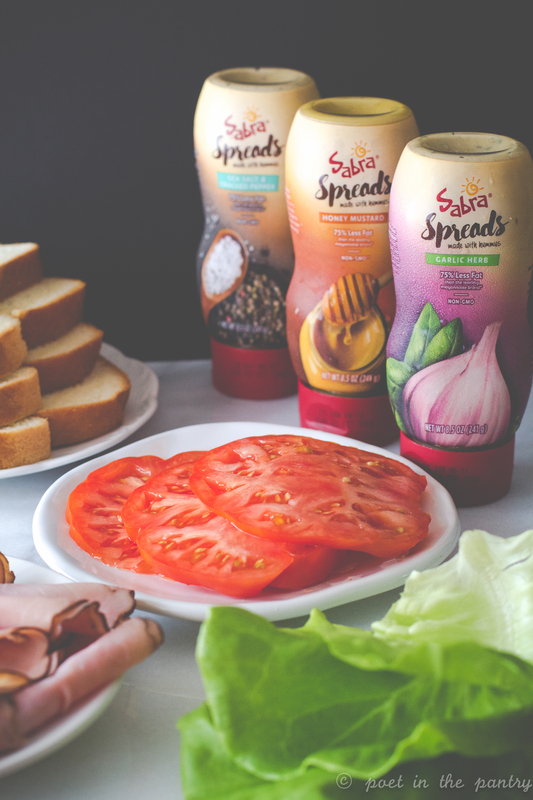 Sabra Spreads are a wholesome, fresh-tasting line of refrigerated spreads made for sandwiches! 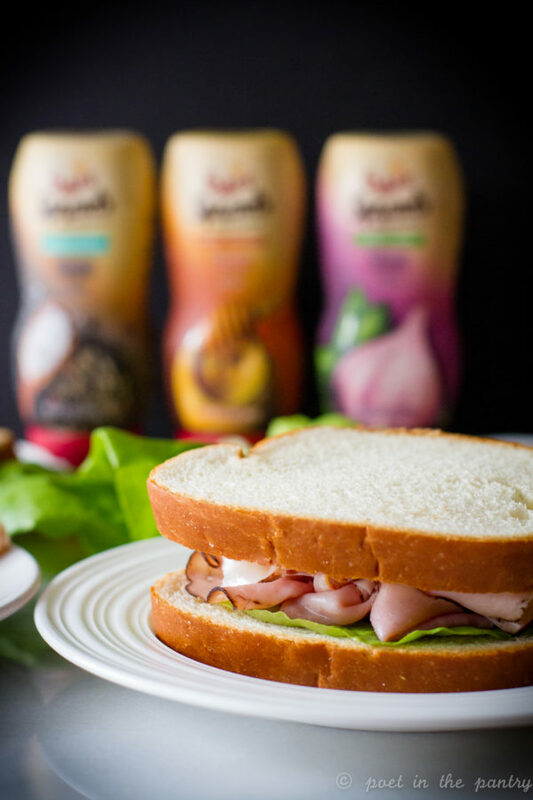 The first of their kind, these cute little squeeze bottles make it easy to add flavor. 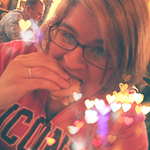 And with 75% less fat than mayo, you’ll be singing their praises, too! The flavors are just fabulous! 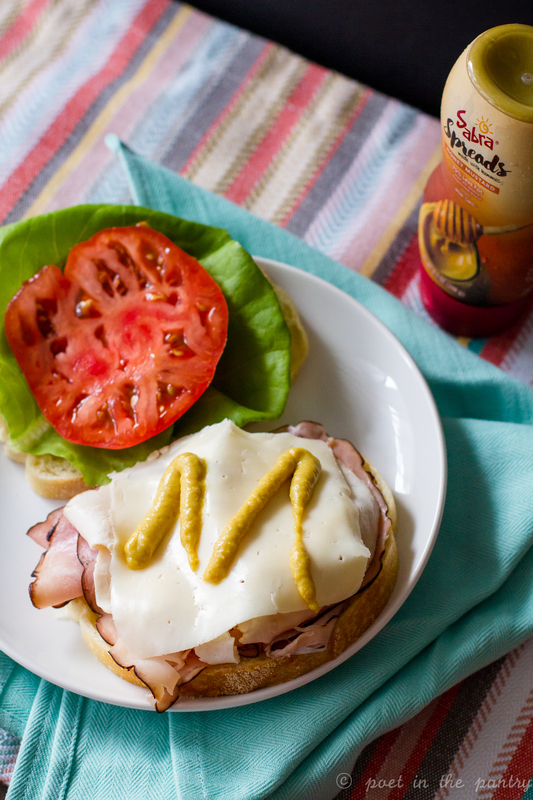 Garlic Herb, Sea Salt & Cracked Pepper, and Honey Mustard go with just about any sandwich or wrap you can dream up. And all three varieties are gluten-free, vegan, kosher, and non-dairy, with 0mg trans fat, and 0mg cholesterol. 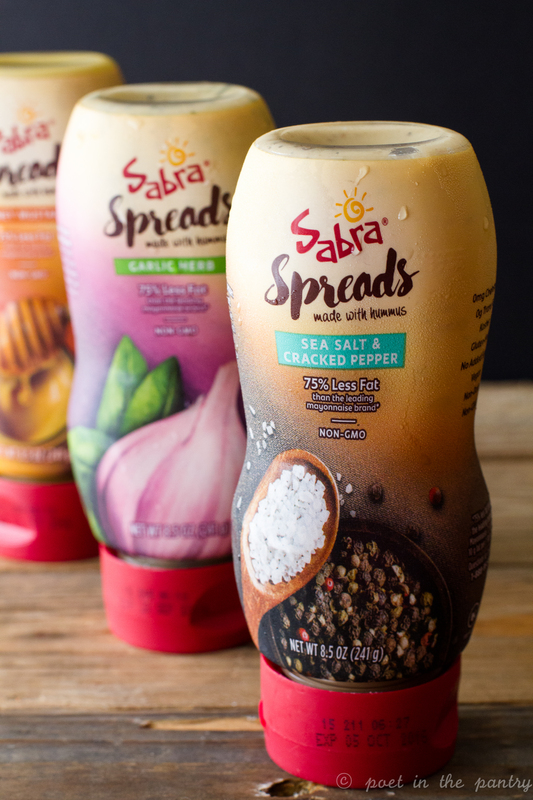 There’s a lot to love about the new Sabra Spreads! 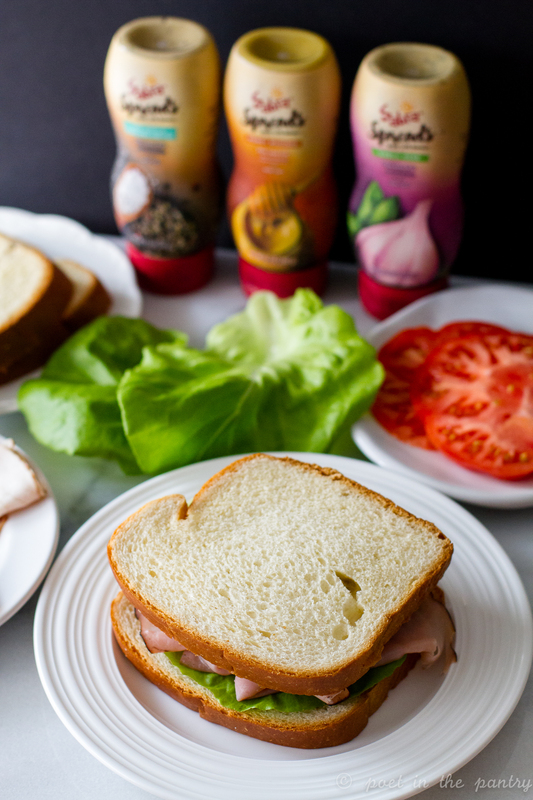 Take 1 slice of bread and layer on it the ham, chicken, cheese, tomato, and lettuce. 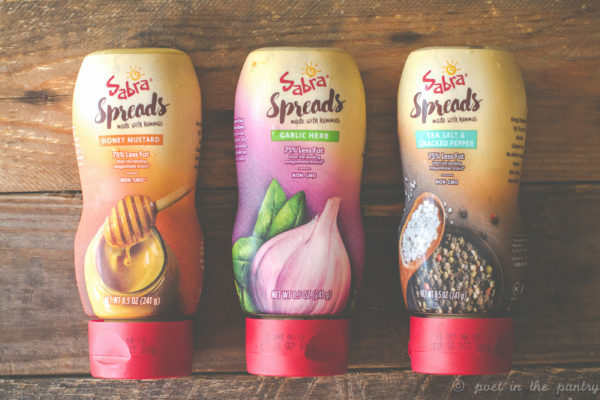 Squirt Sabra Spreads Honey Mustard on top. Go ahead--have fun with it! 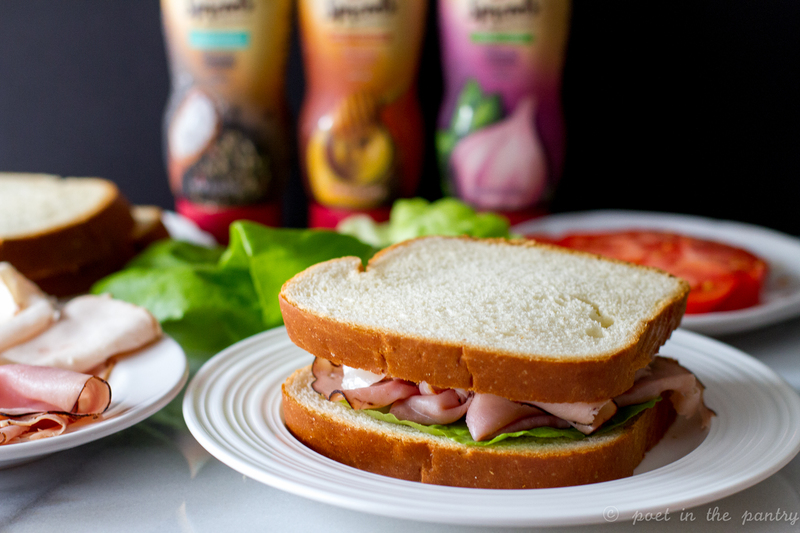 Cover with other slice of bread and enjoy! Where do you buy these? My son tried the honey one last year and whe have not been able to find it anywhere since. The last time I bought them, I got them in the deli section at Stop & Shop. They may have since been discontinued. I’d check the Sabra website to see if they’re still available.